If you're an 80's connoisseur like we are here, you know that two films hold a special place in our hearts every Christmas. Lethal Weapon (1987)is one of those films, the buddy cop genre at its best with comedy and action so good it spawned three more films. Talk of a fifth film has been rumored on line for a while but it looks like people got tired of waiting and rather than dust off the actors that are probably "too old for this sh*t" they put the franchise in reboot mode. In the TV version we have Damon Wayans playing Danny Glover's character Roger Murtaugh. This version of Murtuagh is still over the hill but has a libido that needs attention. He has a family, just like in the films but new in this version is a newborn. While he is not nearing retirement, he has suffered a stroke and would rather be alive for his family in the long run. Not too old and crotchety like Glover's Murtaugh but still a like-able character for the show. The TV version of Riggs took more getting used to. The clothes and adrenaline junkie from the first two films are definitely present in this new version of Martin Riggs. He still has a death-wish and still has the tragic back story from the original concept, however they added that he lost a baby too. Not by South African crime lords, just by bad luck. Clayne Crawford plays this new version of Riggs and while the camaraderie plays well between he and Wayans, no one does crazy and hurt like Mel Gibson. The show had a decent pace and the action in the premiere may have been expensive for a pilot, but it looks like Fox may have high hopes for this one and are willing to spend the money. This new version on old characters is interesting enough to keep following and a nice addition to your Fall line-up. 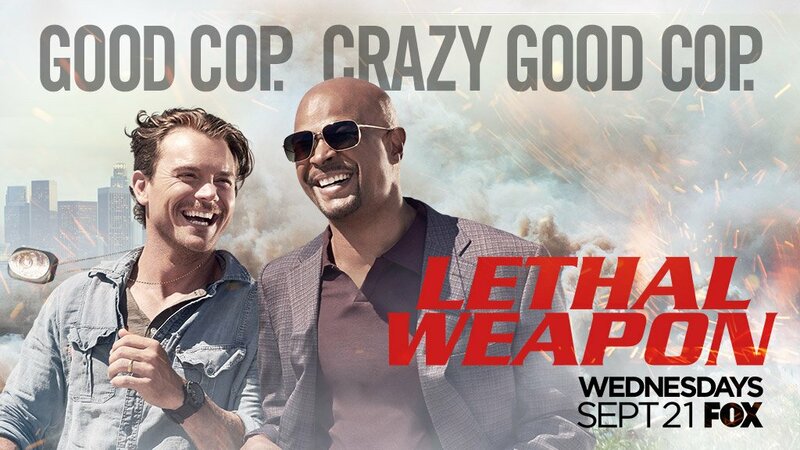 Lethal Weapon airs Wednesdays on Fox.